Loose, ill fitting traditional dentures can be devastating to active adults who fear to eat, speak, smile, or laugh in public. Often the reason for looseness is not poor fit, but that the bony structures that support and retain the dentures (ridges or arches) are inadequate to give the kind of retention and stability that is needed to effectively support the denture for comfort, ease of speaking, and function. Over time, denture wearer's retention only worsens due to continual bone loss (atrophy) of dental arches from the lack of teeth. The significant concerns regarding function, retention, stability, mastication (chewing and speaking can be overcome by utilizing the existing bone present in the jaws for the use of Attachment Retained Implant-Supported Denture. Unlike traditional dentures, attachment retained implant-supported dentures (implant dentures) are held in place by as few as 2 dental implants, which provide retentive strength and stability. 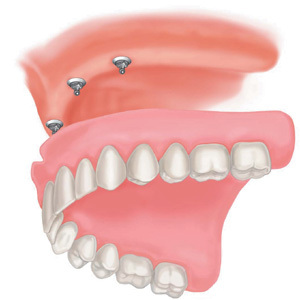 Implant denture attachments are composed of two working components; an implant attachment that is threaded into your dental implant that is placed into the jawbone, and a denture cap that is retained in the underside of your denture. These components meet in the mouth and snap in place, holding the denture firmly. What are the benefits of attachment retained implant-supported dentures or implant dentures? •They are much more secure and comfortable than traditional removable dentures. •You won't even feel like you're wearing conventional removable dentures. •Your ability to eat and speak will be greatly improved. •Implants prevent the bone loss that occurs when you have missing teeth, allowing your facial structure to be maintained. •The lip support provided by implants will reduce the amount of wrinkles you get around your mouth. •Implant dentures cost about the same as traditional dentures with only the additional one time fee for the placement of dental implants and attachments. •No messy denture creams or adhesives are needed with implant dentures. If you would like to know if you are a candidate for this life changing option to traditional dentures, call us and schedule an appointment with Dr. Courey.